Wed. Feb. 7, at 7:00 p.m.
in The Barn at Stratford, 2690 Stratford Rd. in Delaware. 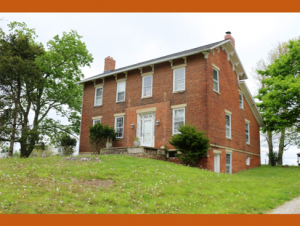 The program will present Delaware County homes that were active Underground Railroad “stations”, that still exist today. During the period from 1800 through 1863, Ohio was a “Free” state but escaping slaves could be captured and returned under Ohio’s Fugitive Slave Law. Many Ohio Citizens, who sympathized with the escaping slaves, helped the escaping slaves travel north through Ohio to Canada. These “conductors” guided the slaves to safe places called “stations”, at great risk to themselves and their families. Delaware County had many such stations. Through research, the Society has identified some stations that still exist (mostly as private homes). 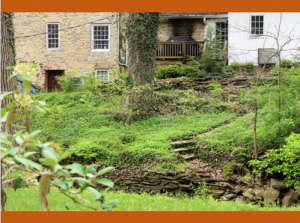 Though private homes now, through photographs many of the homes will reveal their secret hiding places where runaway slaves were aided on their journey north to freedom. Do You Know other Stations? 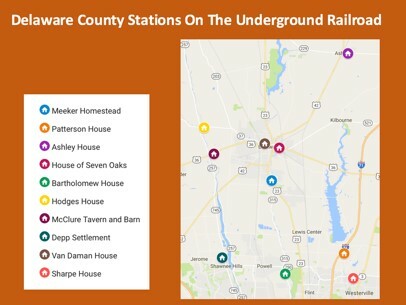 You may know of other Underground Railroad Stations in Delaware County. Come to the program and help The Society by sharing your knowledge and experience with us and your fellow community participants. The program will also present A brief history of the Village of Stratford and The Oberlander Barn. Speakers Bill Rietz, Brent Carson, Diane Williams and Karen Hildebrand will provide the informational content to accompany the slideshow. The Village of Stratford and The Forest Meeker Home, the Oberlander Barn are on the National Registry of Historic Places. 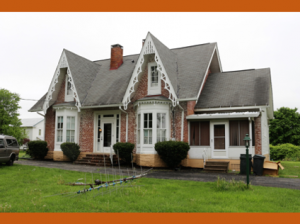 The Society has created a Self-Guided Driving Tour of the known Underground Railroad Homes that still exist in Delaware County. The document of the driving tour that features these homes will be available during the presentation. The driving tour document is also available for download at the DCHS website on our History Walks And Tours page. The program is free and open to the public, however there will be an opportunity to make a donation, which will help defray the operating expenses of the Society. For more information, Programs@DelawareOhioHistory.org or call 740-369-3831, extension 3. Donna Meyer, Executive Director, reports “Our program on the Homes on the Underground Railroad was held on Wednesday. Despite the snowfall we received earlier in the day, we had a great crowd. I counted 120 people. We collected generous donations and sold a number of books, mostly the ones we have on the Underground Railroad. I sold all but one of those and am looking onto having additional ones reprinted by OWU.